Where do we even begin? 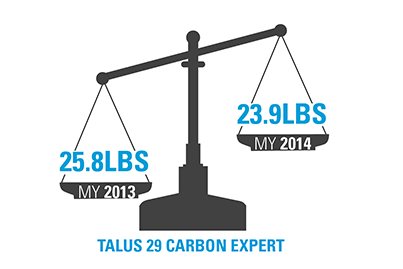 The new Talus 29 frame was updated to have a modern geometry that pairs longer top tubes with shorter stems and chainstays. This positions the center of gravity closer to the middle of the bike and results in a dialed XC fit that allows you to go faster while having more fun. It doesn't stop there. Full Shimano drivetrain with a Deore Shadow rear derailleur, Shimano Deore crankset and Shimano hydraulic disc brakes provide the highest quality, reliable and durable components that allow you to stay on the trail for countless hours. 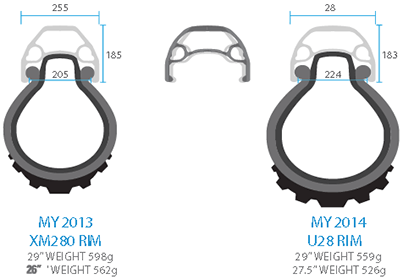 To top off performance we use our 28mm wide U28 rim. The wider rim cross section spreads the tire tread contact patch and allows you to run lower tire pressure while minimizing tire roll. The advantage you ask? Having more rubber on the ground simply allows faster cornering with more confidence. FSA IS-3 45° upper, NO.11N Zerostack Lower, 1-1/8"